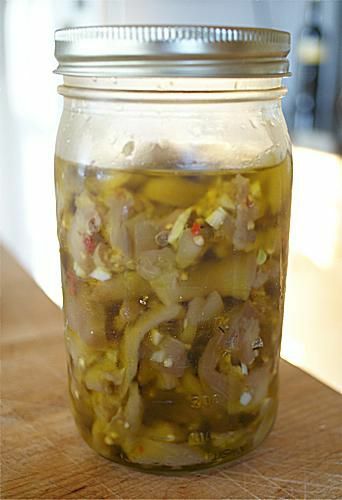 Marinated eggplant is first cooked in vinegar, so it is much like an eggplant pickle. A bit of garlic and a few chili flakes give it plenty of layered flavor. Serve it alongside salads, or simply spread on crispy toasts or fresh baguette. Peel eggplant, and cut into 3-inch-long but 1/2-inch-thick square sticks. Toss with salt, set in a colander over a bowl or in a sink, and let sit to drain for at least 4 hours and up to overnight (if overnight, cover and chill). Squeeze as much of the remaining liquid out of the eggplant as possible by squeezing small handfuls of it. Bring 2 cups water and the vinegar to boil in a medium saucepan. Add eggplant, and cook until tender, about 3 minutes. Drain eggplant in a colander, set a plate on top to weigh it down, and let drain for several hours and up to overnight (if overnight, cover and chill). Again, squeeze small handfuls of the eggplant to remove as much liquid as possible. In a large bowl, toss eggplant with garlic, chili flakes, herbs, if using, and 3/4 cups of the olive oil. Transfer eggplant to a 1-quart jar, add enough olive oil to cover, cover with a kid, and chill overnight. Bring to room temperature to serve.